The rather controversial three man crewed Tactical Response Vehicles (TRV) that have replaced one of the full size pumps at six of the larger North Yorkshire fire stations. They don't appear to carry a ladder. Scarborough 13/09/17. Do we know anything about pump capacity, tank, equipment etc.? It does not seem to look much smaller than a regular rescue pump or water tender. Three person crew simply means you have to wait for a second unit if you are going to use BA, and BA is pretty much compulsory at any structure fire. Added by Rob Johnson on 10 October 2017. I agree they are not that small they weigh in at 10tes. Controversial part of course is the three man crewing. If you google North Yorkshire Fire TRV you will find a lot of info. Added by CraigW on 11 October 2017. Craig: Thanks, I have now looked at the site. What is so obvious is that these units are being introduced simply to be a vehicle to reduce manning levels - and provide less adequate fire cover. The whole point of a light pumper with rescue and minor alarm equipment (and a three person crew) is NOT to reduce fire cover, but to IMPROVE it - by leaving enough personnel available at each station to deal with a serious incident, rather than tying up a large crew at a minor incident, thereby making a slower first response from a more remote station necessary.. If you start out, as in Marseilles, with a nine man pump crew as the norm, then dropping off two or three members to man a light minor alarm truck does not destroy that station's ability to respond to a more serious situation. But if you have three on an FRV and four on a pump, then that pump crew will be hard pressed if they have to start to tackle a structure fire without the FRV team. As for the service actually saying the FRV's job will include to call for help and "prepare" for the arrival of reinforcements, you don't need three fully trained firefighters to do that! Some French SDIS simply have one or two firefighters load whatever equipment seems likely to be needed on to a small van and head off to minor alarms with this, for floods, lock-ins/outs, lifts, minor traffic accidents, non-urgent medical situations, funny smells, problems with animals, snakes or insects, etc , and a skid mounted self contained CAFS tank and reel for car fires. The Italian Vigili do the same, often using a Land-Rover, although they do not seem to have heard of CAFS yet. The German approach is usually quite similar. Hamburg, for example, has one or two rescue pumpers, an aerial and a minor alarm truck at each station. Manned by sixteen personnel, this is the standard first response to a structure fire. It's interesting that at four stations the TRV is full time crewed and the full size pump is retained. So the TRV will be the main response vehicle. Suppose the thing is cutting 48 men is a big wage saving and many UK brigades are between a rock and a hard place money wise. Added by CraigW on 13 October 2017. I understand that UK fire services are in a cost squeeze, and looking for ways to manage to cope as creatively as possible. But there is an obvious answer! Every other country in the World makes use of unpaid volunteer firefighters, even in some of the largest cities like Tokyo and New York City, as well as in smaller communities and medium sized towns like Scarborough. Hanau, in Germany, with just under 100, 000 people, has six all-volunteer fire stations operating twelve pumps, rescue pumps and water tenders, three aerials and three rescue trucks - all staffed exclusively by volunteer personnel. They also have several pod carriers and special purpose pods. If you save forty eight full time firefighter's payroll and benefits, then it does mean you can provide much higher levels of response - especially important in case of a serious incident. My former home fire department on Long Island New York was also entirely volunteer. They covered an area with half the population of Scarborough with five fire stations, operating 11 pumpers, three aerials, two heavy rescues and three ambulances, responding to 1200 fire calls and 700 EMS calls a year. Each station was home to around fifty volunteers with the requirement that each member had to respond to a minimum of 25% of all call-outs. During working hours, the dispatchers called out only one unit from each station on the first alarm, to ensure no equipment was waiting an undue length of time for a full complement of riders. Added by Rob Johnson on 13 October 2017. Some small French towns have a three person full time watch. As all French SDIS combine fire and EMS, they normally man the ambulance. But when a fire call comes in, they man the pump or pump-tanker, although they wait for enough volunteers to arrive so that it can turn out with a full crew of six. The next volunteers to arrive man the second pump - and others remain at the station to man the ambulance in case it gets a call or is needed at the incident. For a minor alarm, the full time watch respond with their equivalent of a TRV (or a light utility van) - and only enough volunteers are called out to provide EMS coverage on the ambulance. The rest are of course still on call if a fire alarm or RTA call is received. I have just read on the FBU website these are now going to be manned by a crew of four. Perhaps they will get a ladder next! Added by John Humphreys on 13 October 2017. Rob, you make some very valid points in your posts on this topic and you actually touch on the point that I would like to add. Both in the USA (especially) and in mainland Europe it is the general case that in urban areas at least there are more firefighters on duty per square mile than we have here in the UK, be they career or volley. For example my last career post was in the city of Newport which had a population of 127 000 and is protected by three fire stations with a total of 19 firefighters 24 hours a day. By contrast one city in the USA that I am familiar with that has a similar population, Fort Wayne, Indiana has a total of 18 fire stations, all running with a crew of at least 4, that's 72 firefighters. The most important thing on any fire truck is it's crew, as without that the equipment it carries and it's capabilities are useless. And as we all know at any large fire it's the firefighters brought to the scene by the numerous appliances/apparatus that are used, not the equipment itself. Added by Andy Fish on 17 October 2017. Most British fire services seem to spend around 55% to 70% of their annual budget on payroll and related expenses. If some staffing was supported by unpaid volunteers, fire cover could be actually improved at the same time as lowering total costs. I know that since WWII there has been no tradition of unpaid fire service volunteers in the UK, but if the service is being squeezed so severely, then it seems the time has come. Rob, The other key factor to the numbers of firefighters on duty, be they career or volley, within the USA and Europe among other countries is that in most cases these depts. operate the EMS service as well, or at least correspond. 70% of US fire depts. responses are for EMS calls and as such the fire cover required is much higher. When/if the UK fire and rescue service adopts EMS duties then I would anticipate, and hope that firefighter numbers and stations would increase to absorb the additional call volume. There are volunteer firefighters here in the UK, with the Scottish Fire and Rescue Service the highest user, mainly on the numerous islands. I can't say for the present day but the city of Peterborough did/does operate a vol. fire brigade and I believe that Devon and Somerset also have two volunteer stations at Hartland and Kingsland, they certainly did when I served in that service. I do not ever foresee volunteer firefighters becoming common here. Most services face challenges recruiting retained firefighters who are paid. It is also sadly the case that the British public do not have the degree of respect for firefighters that is the case in the USA and Germany for example. In fact pre Grenfell Tower many people here regarded firefighters as just another group from the public sector who were a drain on taxes. Not much of an incentive to do the job for no pay !!!! Added by Andy Fish on 19 October 2017. British people seem to have been able to demonstrate a willingness to volunteer in many other areas over the years, and I don't believe it is the only country in the World where recruiting volunteer firefighters would be impossible. After all, you do not need very many people. 400 out of a population of 147, 000 is not a big percentage! Another commonplace practice - especially in the USA - is a protocol to recall off duty paid firefighters to man reserve equipment on second or multiple alarms. At any time, around 80% of the full time force are off duty - an instantly available fully trained resource that is there when it is really needed! I take your point about EMS, but when you figure out the staffing and the ratio of EMS units with small crews to fire and rescue units with four to six person crews, the numbers who man the fire trucks are still much higher. And, as it turns out, Heidelberg does not operate that city's EMS units, so that comparison is balanced out. It is only too clear that the UK is already operating its fire service "on the cheap". Without using volunteers and/or a formal recall system, it can only get worse, and increasingly dangerous for both members of the public and the service themselves. I had no idea that the use of volunteer firefighters was so extensive abroad. I have always regarded the retained duty system as great value for money. As a failed applicant to Scottish service it was clear that they are expected to meet all the standards of career firefighters and commit to extensive training over and above daily work rewarded by the extra earnings. Perhaps it says something about the British mindset that even RDS stations struggle for recruits. Where would the volunteers come from? Added by M G on 19 October 2017. I take your point about the fact that many US and European fire services operate EMS units. So I looked at uniformed staffing levels for London Fire Brigade and FDNY. Both serve cities with 8.8 and 8.6 million citizens respectively. Although FDNY operate the city's EMS units, they have a separate organization with 4, 414 personnel. The uniformed firefighting staff - who do not man ambulances - number 11, 050, or one for every 778 citizens. London employs 5, 992 - equal to one for each 1, 468 people, which is around half as many! This enormous difference is clearly reflected in the much larger numbers of fire stations, pumpers, aerials and other apparatus which are manned and ready to respond around the clock. In Chicago, where I live now, the watch comprises around 1, 000 members, but over 800 of them are riding fire trucks - nearly 100 pumpers and 50 aerials, as well as chiefs' cars and specials. Compare this to Greater Manchester, with half as many pumps and a handful of aerials. It's not only the public that hold such an opinion but often their employers, the local council. Then there is the union who would like to see retained crews replace by whole timers. Added by Neal Glover on 19 October 2017. I sincerely hope that the awful recent events in London might help bring local authorities heads out of the sand. Unfortunately, it seems that throughout history that big steps to improve fire protection only ever follow disasters like this one. I do understand the FBU's attitude, which is of course not new. But under-manning is a safety issue for their members, as well as the public. The Grenfell Tower is an example. Four pumps, no aerial or rescue, no senior officer on the first alarm. Only around twenty firefighters. This is half of the standard hi-rise fire response in New York or Chicago! If the FBU want to help their membership, why not encourage a recall system - so that off-duty firefighters can respond in the same way as retained firefighters and be paid to do so? Many American cities operate this way, requiring their full-time members to reside near enough their base fire station to respond within around 15 minutes. This does not increase the numbers who can respond quickly enough on a first alarm, but it does mean that when things get busy an entire fleet of reserve equipment can be already crewed and ready to roll. There are even cases where one department will have on-duty full-time, recalled off-duty full time, paid on-call and additional volunteers, plus some younger retired full-timers also on call. Added by Rob Johnson on 20 October 2017. The UK is indeed the only country I know about which employs barely any unpaid fire service volunteer personnel. In all cases, these countries have far more firefighting personnel resources than the UK on a per capita basis. For example France, with almost exactly the same population, has 5.9 times as many firefighters. Adjusted for population, the US has 5.3 times as many and Germany has more than 20 times as many! Added by Rob Johnson on 24 October 2017. As far as I know though unlike the ambulance service none of the UK fire services are struggling to meet demand. Added by CraigW on 24 October 2017. I suggest you read some of their annual reports, which detail the cost cutting which they have been doing, as well as the future cost reductions they are having to make, often referred to in their strategy and forward planning commentaries. The infamous Bain Report set the stage for all of this, and - to my amazement - this very detailed study with all its recommendations for the future shrinking of the British fire service did not even look at any overseas fire service for any kind of input! Added by Rob Johnson on 25 October 2017. In the BBC news today a report that changes are afoot in Scotland regarding poss station closures and replacing whole time with retained in urban locations to get away from a model first based on 1947. Along with developing towards medical services too. I repeat again where will they come from? Added by M G on 25 October 2017. MG: If other countries are looked at, the short answer is that firefighting volunteers come from just about everywhere in society! Young, old, students, workers, professionals, self-employed, male, female, housewives, clergy, tradespeople, business owners, educators, ex-military, retired people - just name it! Some very successful recruiting is through youth programs, which are very commonplace especially in France and Germany. Young people can join at fourteen, and actually start training and then attending calls after they become eighteen. In some countries, military pensioners - who can be as young as twenty-six - are also a major source of personnel, and in commuter suburbs an increasing number are stay at home mothers. Some US departments have no upper age limits, and a few very fit seventy year old's still respond to alarms! Added by Rob Johnson on 26 October 2017. Do these countries have similar medical and fitness standards as operated here in UK? Added by M G on 27 October 2017. They vary a lot. Some are very rigorous, others less so. Added by Rob Johnson on 01 November 2017. I admit that I have little knowledge of the operations of the fire and rescue service. But when you consider the way the service is provided in other countries perhaps then some carefully considered modifications could be made, with reference to variable and mixed crewing of different types of vehicles to meet the ever broadening array of incidents to attend. If it was in the name of modernisation rather than financial pushing. Perhaps interesting times ahead in Scotland. Added by M G on 03 November 2017. I think having more volunteer firefighters in the UK is a pipe dream. It's a sad reflection on the state of this country. The only reason today's volunteer stations exist at all is through absolute necessity. And the local heroes that perform this most valuable of service are, first-and-foremost, friends and neighbours. Close-knit communities that know and respect one another. Very little community spirit exists in the rest of the UK. People can live next door to someone for years and not ever get to know their names! They'll never even speak. They might grunt or nod if they're unfortunate to bump into one another as they set off on their miserable morning commutes. But rush into a burning house to rescue them! You're joking, aren't you? Only if their own property is at risk, maybe! But to do it for NO MONEY????? For some bloke around the corner? Him with the noisy motorbike? You can sod that for a game of soldiers! Unfortunately that's the attitude of the vast majority of British people. They won't do anything unless someone's paying them. Sad times. On the rare occasion when somebody does do something amazing, it's so rare it often makes the news! There is no community in Britain. You only have to look at the anti-social epidemic that blights our lives: litter, graffiti, vandalism etc. If you pick up some selfish lazy litterbug's latest cast-off and put it in the bin, passers-by look at you as though you've gone mental! Added by Yelp Bullhorn on 09 February 2018. Yelp: Of course I think you may be right. It is after all forty years since I left Britain to live in the USA, and obviously many things have changed. But I do hope you are not. Just about every other country has lots of volunteers, and some - including Chile - are 100% unpaid volunteer. These include everyone in all the large cities, not least Santiago, with over five million people. So its not only a local community phenomenon - its a big city thing, too! When my own house got on fire, they were quick and efficient, led by an experienced volunteer Deputy Chief, who got there first, and knew exactly what needed to get done. His lads followed his lead to the letter and together they did a good job. In another case, a restaurant caught on fire in the night near our lake house in Indiana, and the local volunteers were doing very well until a nearby town's full-time "professionals" turned up. These guys used their aerial to cut a huge roof vent well away from the actual fire, actually shut down the hydrant the volunteers were already using for their interior attack, and subsequently lost the building as the fire was left to simply spread along it to the unnecessary roof vent! Even New York City has volunteer fire companies on the barrier islands in Queens where FDNY cannot respond quickly, and other major world cities like Tokyo and Berlin have huge numbers of volunteers too. I sincerely think the UK may have no choice but to go in this direction, because the current paid organizations are under continuing and increasing cost pressure, and are actually not providing very good value for money by international standards. Added by Rob Johnson on 13 February 2018. I know our local village station has had a number of applicants turned down (including me ) for different reasons. As the role of a firefighter further develops away from fire towards EMS and prevention and others then perhaps a one size fits all standard restricts the employment pool. Added by MG on 14 February 2018. MG - True, if that's the way its done! But in Germany, for example, specialist roles are very often assigned to individual volunteer fire companies in each town or city. One may be the hazmat team, another have water supply relaying equipment, another handle water rescue and the dive team, a different one looking after line rescue, another collapse rescue, a sixth specializing in nuclear incident response, a seventh running the heavy crane and its tender, another handling bulk foam incidents, and so forth. These specialized functions are, of course, in addition to the basic job of firefighting, rescue and general service call response, using standard pumpers, aerials, rescues and tankers. But in Germany, volunteer fire fighters rarely respond to EMS incidents. There are enough EMS units - provided on both a volunteer and paid professional basis - to cover the need. However in France, volunteer firefighters who are EMT qualified regularly do man ambulances as well, and many US fire departments also do this. My local volunteer fire department on Long Island did around 700 ambulance runs last year with an ambulance at three of its five fire stations, as well as some 1, 200 fire and rescue shouts. Their role is to support the front line EMS, which is provided by the county police department - so they are called out mainly when the police ambulances are too busy to respond within the prescribed ten minutes. You don't need every volunteer firefighter to be a qualified EMT or paramedic to be able to man a single ambulance, and of course one solution is to recruit some volunteers who are already qualified! Added by Rob Johnson on 15 February 2018. I was sceptical of how a volunteer crewed fire service could work. A very successful organisation with minimal wage bill!!!! Added by MG on 08 March 2018. Despite having 75% of their fire service staffed by unpaid volunteers, the French fire service as a whole still spends 82% of their budget on payroll. Just imagine how much more their service would cost if they had to pay them! Added by Rob Johnson on 11 March 2018. Although the news is a little old now, the TRV's based at Day Crewed Stations in North Yorkshire (Tadcaster, Northallerton, Malton and Ripon) are to have their crew size increased to four firefighters by April 2018. 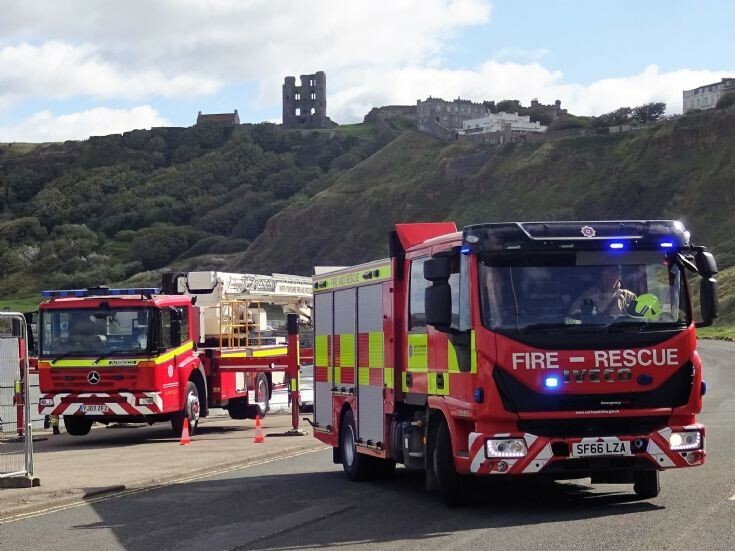 The two TRV's based at Scarborough and Harrogate will remain with 3 crew as there is also a wholetime full sized Rescue Pump at these stations to back up the TRV. It was also in the news that the TRV's are to be adapted to carry a longer ladder on the roof. There is also a rumour that in the fullness of time the TRV's may be cascaded to certain Retained Crewed Fire Stations where crewing is 'difficult' and the full sized Rescue Pump is often 'off the run' as a full crew is not available. The TRV being able to respond with fewer retained fire fighters pending back up from other fire stations. Added by Pete S on 18 March 2018. In the USA this is called "going down the tubes". Added by Rob Johnson on 20 March 2018. A brief update and correction. The Israeli Fire Protectorate has approximately 62% unpaid volunteers among its 5000 uniformed personnel. Added by Rob Johnson on 28 September 2018. At the time of writing the North Yorkshire, TRV's have been withdrawn due to safety issues, breakdowns and poor road holding when being driven at speed. Added by Andy Reece on 19 January 2019. Iveco trucks are not famous for reliability. It was one of the brands my company marketed in the Middle East when I worked in Kuwait, and we sold a fleet of tankers to the KFP, which were too unreliable for fire service use and were quickly replaced by other makes. They are however usually cheaper than Benz, MAN or Scania. I hope the brigade admits yet again they have wasted the taxpayer's money and by having these not only have they put the taxpayers lives at risk but also the crews. Added by John Johnstone on 25 January 2019. As I have mentioned above and on this site, every other country in Europe and the Americas, as well as Australia, New Zealand, Japan and many others provide much more personnel and equipment to respond to fires and other emergencies than fire brigades in the UK - and at less cost. Less payroll - or zero payroll - means more can be spent on appliances, fire stations and equipment. Just compare the fire service's coverage in Hanau which I explained above to any city of 100, 000 population in the UK, and it is obvious that German citizens get much more for their tax payments! Added by Rob Johnson on 30 January 2019. I take it these TRV's are still 'off the run' as Northallerton's Day Crew are currently trucking around in a clapped out 53 Reg (2003) Volvo which looks to have seen better days? Plus doesn't a full size pump need 4 firefighters to operate it as opposed to a crew of 2 or 3 on a TRV? Where are the extra crewmembers coming from? Makes you wonder why they bothered getting the TRV's in the first place. What a waste of council tax payers money. Added by Richard Pettinger on 15 March 2019.